ST. LOUIS — A $150,000 grant from The Leona M. and Harry B. Helmsley Charitable Trust will support research at Saint Louis University led by scientist Gina Yosten, Ph.D. Yosten's team is pursuing solutions for people with diabetes who are at risk of life-threatening drops in blood sugar known as hypoglycemia. "This project is focused on a very dangerous complication of type 1 diabetes called hypoglycemia," said Yosten, who is assistant professor of pharmacology and physiology at SLU. "Hypoglycemia is especially risky for those on insulin. If people take a little too much insulin, their blood sugar drops. This can lead to seizures, coma, and even death." Yosten's lab studies g protein-coupled receptors (GPCRs). GPCRs are the most abundant receptor family encoded by the human genome and one of the most popular drug targets for those designing new medicines. 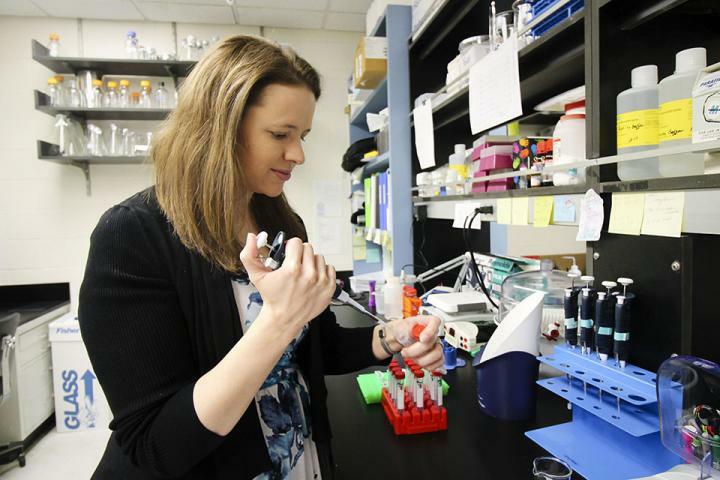 Her team focuses on metabolic diseases, and, in particular, diabetes. In this study, Yosten's team is examining a missed signal that can cause those with type 1 diabetes to develop hypoglycemia. Normally the pancreas releases a hormone called glucagon, which tells the liver to start making glucose. However, in type 1 diabetes there is an inability to release glucagon, which may be the result of a missing or aberrant signaling. "Usually people with diabetes can sense when they have low glucose, so they can go eat an orange or a piece of candy to balance out their blood sugar," said Yosten. "But, individuals that have been diabetic for longer periods of time can lose their ability to sense episodes of low blood sugar. Together with their inability to release glucagon properly, these people are at a very high risk of developing dangerously low blood sugar that can lead to dangerous and possibly fatal outcomes." "Our grant is focused on trying to get the pancreas to release glucagon again in response to low glucose." In previous work, Yosten's lab discovered neuronostatin, a protein produced in the pancreas that drives glucagon release. "Neuronostatin's release may be impaired in type 1 diabetes," Yosten said. "If we can develop a therapeutic drug that mimics neuronostatin, it may protect against hypoglycemia." The team's previous work has been centered on animal models, and this grant will allow the research to advance to human models. "Within their work supporting scientific research, the Helmsley Charitable Trust focuses on funding translational research, and so we are proud to announce that our work will be done in human pancreas cells," Yosten said. "We're also going to be collecting blood samples from people and evaluating how neuronostatin levels change in response to low blood-glucose levels." Yosten hopes that this work will lead to the development of new therapies to help those at risk of the dangers of hypoglycemia. The Leona M. and Harry B. Helmsley Charitable Trust aspires to improve lives by supporting exceptional efforts in the U.S. and around the world in health and select place-based initiatives. Since beginning active grantmaking in 2008, Helmsley has committed more than $2 billion for a wide range of charitable purposes. For more information, visit http://www.helmsleytrust.org.